It is common for a homeowner association (HOA) to charge an exit fee. What you describe cries for scrutiny. Here are three possibilities to consider. Reader Question: ​We are in the closing process of selling our home. We just learned from our agent that the title company received an invoice for eleven hundred dollars from the company that manages our homeowner association (HOA). This is a shocking HOA exit fee. We checked around with friends that have moved out of other HOA’s in the area, and if assessed, all were minimal in comparison. It is much higher than other HOA exit fees in our area. We then asked the management company for the HOA documentation authorizing this procedure. The response was the HOA did not put this information on their website or in any documents for legal reasons, and because they did not want the homeowners to know of the existence of this fee until they moved. The home values in our community average under $300,000. Since it was not mentioned in the bylaws, declaration of condominium or on the website, on what basis do they have the right to demand these funds from us? To what sort of oversight is an HOA subject? Is there anything we can do? Monty’s Answer: ​It is not uncommon for HOA’s to charge relocating homeowners a fee similar to what you have described. It is a method to generate income for the HOA to defer the expenses the HOA incurs in providing home sellers a lien-free certificate. Each HOA considers its history and physical characteristics to determine methods to generate revenue. To establish an exit fee in a condominium and to establish the dollar amount or formula for calculating the fee, the HOA would likely be required to follow the procedures in the condominium documents, and therefore, the law. Every state treats the subject differently. A misunderstanding or an error of some sort, like bookkeeping, transcription, or communication error. Seek to understand first, and then be understood. Go directly to the president of the HOA to ask for clarification. The exit fee has been described to you correctly. From the HOA’s point of view, this fee is a way to generate revenue that holds down the monthly dues. Most HOA members do not want to see increases in contributions. Here they have devised a method that only impacts the departing members. If you learn the explanation on HOA operations is accurate, you can decide to accept it, or you can choose to resist it. If you do not want to jeopardize the sale, consider closing the transaction and attempt to recover the cost later. You may also determine if you must disclose this matter to your buyer. It is also possible there is illegal activity here. You received an answer that cries out for further scrutiny. While it is possible the board was ill advised in authorizing this practice, it is just as likely that one or two people could be colluding to defraud the departing homeowners and the homeowners association. This person (or persons) could be in the HOA leadership or in the management company or both. While state law will contain HOA regulations, there is little oversight of the HOA itself in most states. If you suspect irregularities, consider consulting with other unit owners to alert them, share the workload, and spread any potential financial risk. Consider reading the HOA provisions in state law, and then consulting with an attorney licensed in your state that specializes in condominium law for a legal opinion about what steps to take to resolve the situation. Misunderstandings between unit owners and the HOA or management companies are quite common. With the presence of 350,000 HOA’s and the number of Dear Monty HOA and unit owner questions, it stands to reason that there is litigation. Most unit owners in condominium associations have little training or experience in managing property and dealing with vendors. 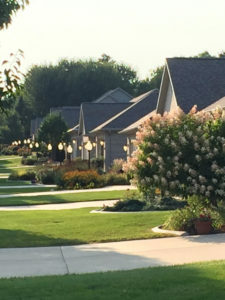 Theft from homeowner associations is not uncommon. You can get a sense for this by typing “theft from condominium associations” into your computer’s navigation bar. The rise in popularity of condominiums has created a number or organizations whose sole purpose is to educate and train unit owners in condominium associations what they must know to be effective when serving on a HOA board of directors. Protecting the community from financial fraud by installing safeguards, learning how to identify and vet contractors, and best practices in associations large and small are just some of the information they provide. They are called HOA community associations.